Adding an AVW200 to an Existing THREAD. This configures the THREAD to communicate directly with the AVW200. MUX Configuration Specify the type of MUX's connected to the AVW200 and then the vibrating wires connected to each of the mux's channels. The AVW200 will now need to be configured to host either a MUX or directly connected vibrating wire to each of the 2 channels. The Vibrating Wire Channels will then need to be configured to the specific VW you are using. If you have exited device configuration, click back into the AVW200 by finding it in the Devices & Sensors list on the right hand side of Network. This will open the Device configuration settings. 1. Click the drop down to set channel 1 of the AVW200 to either a 16 channel MUX or a directly connected VW sensor. Select none if nothing is connected. 2. Click the "Edit Configuration" button under VW Mux Information. 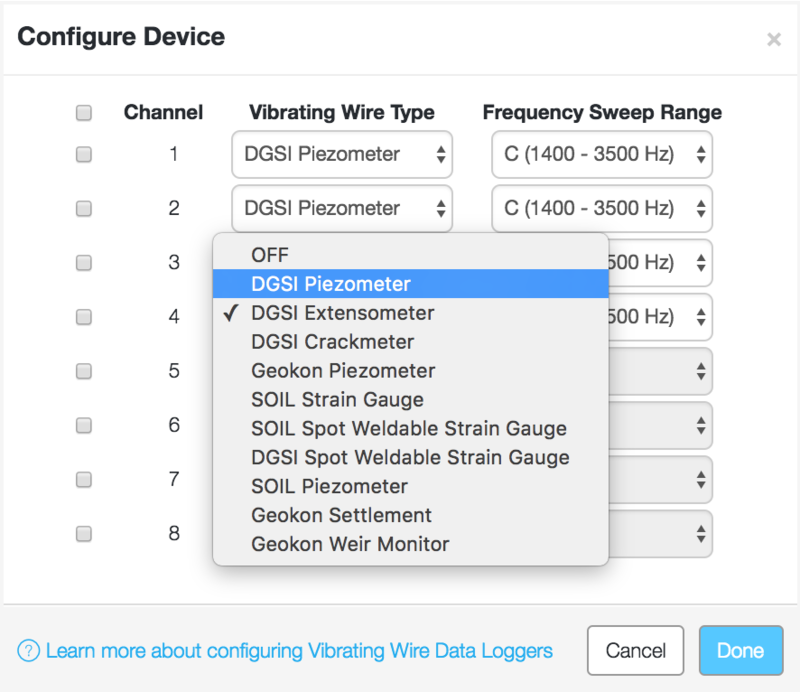 Select the type of vibrating wire that is on each channel and the suggested Frequency Sweep will be automatically filled in. Click save to write the settings. Once saved, the configured vibrating wire sensors will populate beneath the AVW200 Device and can be viewed by clicking the drop down arrow. Sensors will be named according to which Mux and which channel it is configured on respectively. Additional calibration factors will need to be entered for some types of vibrating wires, see the Vibrating Wire article for details.